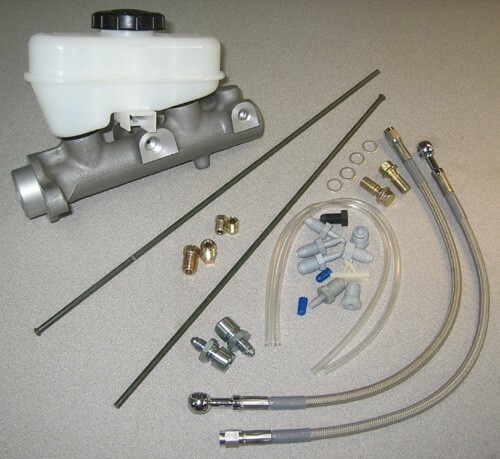 This kit combines both our popular Aluminum Master Cylinder Conversion Kit and DOT Stainless Braided Front Brake Hose Kit into one money saving option. Aluminum master cylinder with 15/16ths, 1" or 1-1/6th bore and see through reservoir. 15/16ths is perfect for 2 x 38mm Cobra PBR calipers. 1" bore recommended for those wishing to use the 2 x 40mm calipers. 2 x 16" braided hoses with 10mm banjo fittings. 2 x adapters for the end of the hose to OE hard lines including groove for OE brake line clip. 2 x Banjo bolts (optional). Please tell us if you need coarse or fine threads. 1965-70 Mustangs using Cobra/Mach 1/Pony PBR calipers.